Biocides are chemicals or microorganisms preventing damages caused by microbes or other organisms: They protect industrial products and consumer goods as well as animals and human beings. Biocides often contain the same active ingredients as plant protection products. While plant protection products are only used in the agricultural sector, biocides are utilized in numerous application areas. Other biocides (antifouling agents, products for embalming and preparation of carcasses). Ceresana analyzed the global market for biocides already for the second time. Although these products are added to the end products in only relatively small amounts, revenues of about USD 6.6 billion were generated with biocides worldwide in 2016. The current report expects a growth of revenues of, on average, 2.1% per year. With share of about 41% of global consumption, North America is the major sales market for biocides. This region also accounted for the highest revenues in 2016. Asia-Pacific and Western Europe followed, ranking second and third. All regions utilized by far the highest amount of biocides in the segment water treatment. Application in the segment wood preservation followed in the regions Eastern Europe, North America, and South America. In Western Europe however, the segment disinfectants ranked second; in the region Asia-Pacific, the second highest amount of biocides was used in the paper industry. By contrast, biocide demand in the application area plastics ranked second in the Middle East and Africa. This report analyzed, among others, which role the individual types of biocides play on the global biocides market. The worldwide highest revenues in 2016 were generated with biocides based on halogen compounds, followed by biocides based on metallic and organosulfur compounds. Revenues generated with biocides based on halogen compounds that are, for example, used for tap water treatment, amounted to over USD 2 billion in 2016. Several ingredients are often combined to generate synergy effects. Chapter 1 provides a description and analysis of the global biocides market – including forecasts up to 2024: demand and revenues are explained for each region of the world. This chapter examines total revenues as well as revenues split by biocide types. 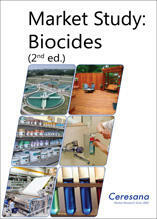 Chapter 4 analyzes revenues of individual types of biocides based on halogenated, metallic, organosulfur, nitrogen, and phenolic compounds as well as other biocides. Chapter 5 provides company profiles of the largest manufacturers of biocides – clearly arranged according to contact details, revenues, profit, product range, production sites, and profile summary. In-depth profiles of 86 producers are given, including Akzo Nobel N.V., Arkema S.A., BASF SE, DowDuPont Inc., Evonik Industries AG, Kemira Oyj, Lanxess AG, Lonza Group Ltd., SK Global Chemical Co., Ltd., and Solvay SA. Table 91: Revenues generated with biocides in the segment plastics in Western Europe In 2016, revenues of about EUR 31.8 million were generated with biocides in the segment plastics. Germany accounted for the highest share of this amount. This country will account for the highest growth rates in the upcoming eight years. Total Western European revenues will increase by 1.3% p.a. to EUR 35.3 million in 2024.